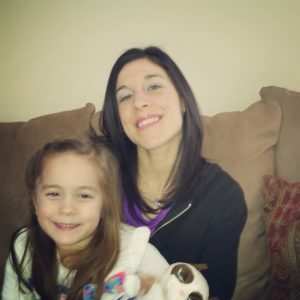 sight words Archives - Miss Jaime O.T. 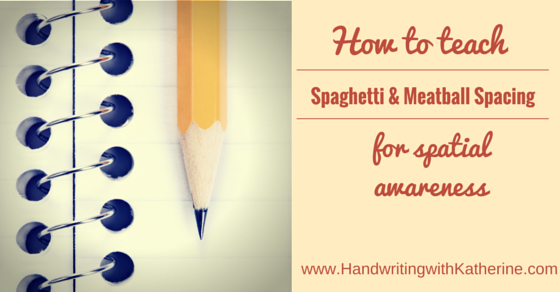 I am so excited to share my “spaghetti and meatball” lesson on Handwriting with Katherine’s Summer Fun Series. 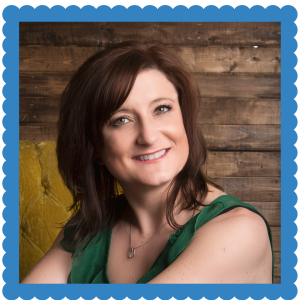 I am honored to be featured as a guest blogger for this fun and informative series of posts. Check out http://www.handwritingwithkatherine.com/ for some great posts and activities. 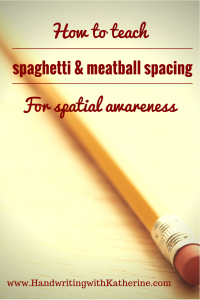 Click here to learn all about “Spaghetti and Meatball Spacing”. 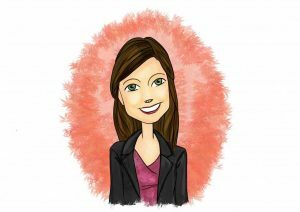 I’m so excited to be participating in my first blog hop, courtesy of Speech and Language Literacy Lab. In an effort to promote Better Hearing and Speech Month, SL3 has gathered over 30 professionals in the educational field to offer their expertise on RTI in the school setting. 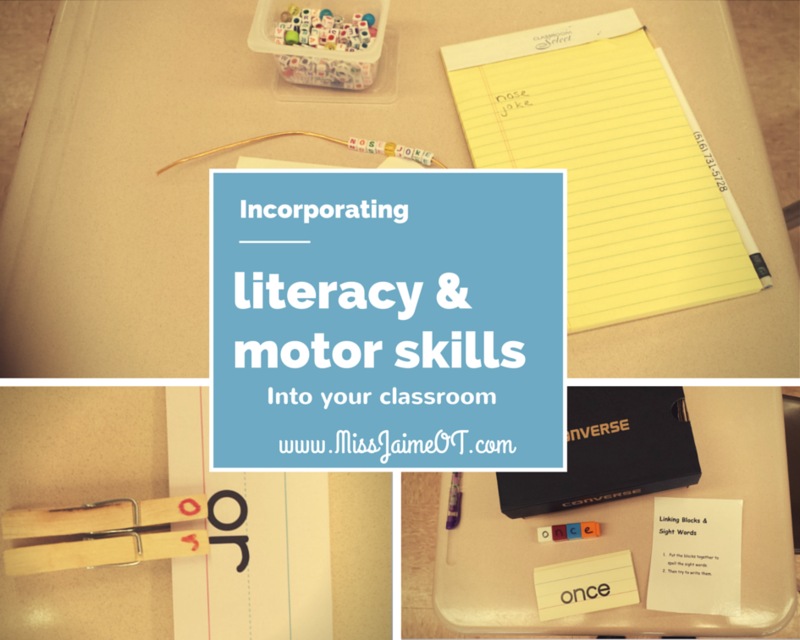 Today I will be blogging about the importance of incorporating motor skills into literacy centers for children. Common Core standards have increased the expectations we are placing on our little ones. As an Occupational Therapist, one of my concerns is that the children are still given opportunities to use and develop their motor skills throughout a typical school day. Over the past few years, I am finding that children’s motor skills are decreasing, rather than improving. So what can we do? Tons of things! There are so many ways to incorporate movement into reading and literacy lessons. Why not work on two skills at once? RTI stands for “Response to Intervention”. Response to Intervention (RTI) is a framework used by teachers to help children who are struggling. For example, a first grade student is behind his peers in reading. The teacher will use his test scores or other strategies to provide targeted interventions to address that deficit. What does that mean? It means the teacher will determine where the child’s weakness is, and then provide specific strategies and lessons geared to helping that child improve on that skill. If the interventions don’t work, the teacher will provide more focused interventions. RTI is a 3 tiered process. It allows a general education student to get the help they need before falling significantly behind. It is designed to be pro-active in helping children to catch up to their peers. For more information on RTI, check out this link. Anyway, RTI is here to stay and it’s a great way for teachers and parents to keep track of their student’s success. 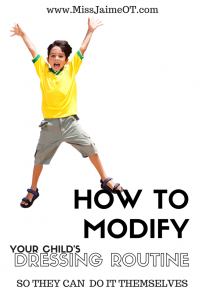 RTI strategies can be used for learning, behavior, and even motor skills. One of my best ideas (in my opinion!) over the past two years was to create “motor boxes” in my classrooms. I collected shoe boxes from all the teachers in my building and then had a blast building activities that incorporated both motor and literacy skills. The boxes were designed for each child’s special learning needs. I admit it took a while, because I created the boxes based on each child’s individual needs. However, the idea behind the boxes is perfect to use from an RTI perspective! So I am going to share the ideas/boxes that I created for my classrooms in hopes that parents, teachers, OT’s and Speech and Language Pathologists will create similar activities to use with all of their students, too! My teachers have given me great feedback on the boxes. They told me that the “motor boxes” are great for independent working time. This allows the teacher to pull children in small groups while other children work independently at their desks on the motor and literacy skill in their box. From an RTI perspective, a teacher could create multiple boxes so the children can take turns using them, working on different skills. I found it very helpful to create a “star chart”. I numbered each box. Then I put the children’s names and the box number on the chart. After a child finished the task in the box, they were excited to go over to the chart, find their name and put a star in the column of the number box they did. This also eliminated a different problem. Kids were avoiding the “difficult” boxes! Now we had a way to ensure that each child worked on all the different skills we planned. The first thing I did was to ask my teachers for a list of the skills they wanted to work on as well as the sight words they would be teaching this year. Then I used the information to create each box to be a little different. As I said, the children were all at different levels, so I had to make the boxes hard enough to be challenge, but easy enough to succeed: “The just right challenge”. As we all know, school materials can be expensive! I recycled a lot of things and then used Dollar Store materials to supplement where I needed to. Here were some of the activities that I came up with. So this was an easy one. The Dollar Tree sells sight word flashcards in different grade levels. For a Dollar, you get a whole stack of words of different levels of difficulty. I separated the words into two piles and put the “difficult” ones away for the second half of the year. I love clothespins to work on grip and hand strength. Again, the Dollar store always has them. I took a sharpie and wrote the letters of the alphabet (a different letter on each side) on the top of the clothespin. 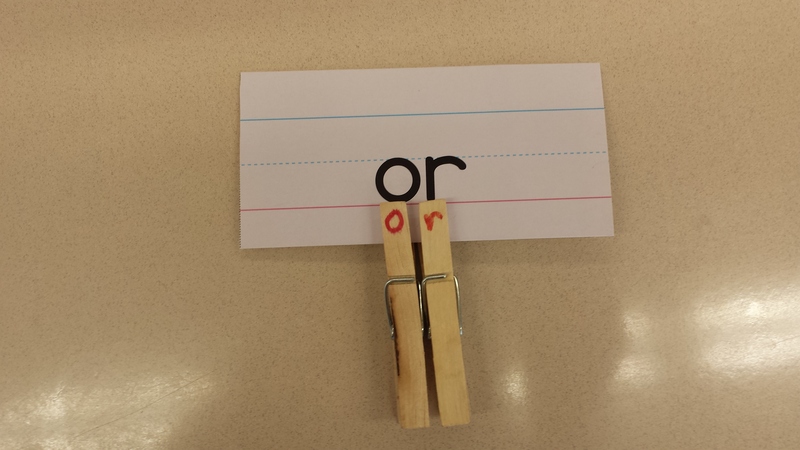 I did extra clothespins for vowels and popular letters like s and t. And that was it! The kids are now reviewing grade level sight words, much like flash cards. Plus, they are working on bilateral coordination to hold the clothespin and the card at the same time. They are increasing their hand strength (particularly their Pencil Grip muscles) to open and close the clothespins, too! This box also incorporates Visual Figure Ground – the ability to find what you are looking for in a busy background. Many times the kids will say, “I can’t find an A!” even when it was right in front of them. They had to track and scan through the pile to find what they needed. This is just like looking all through the fridge to find the milk (that is right in front) or looking through your crayon box to find the black (even though it’s right on top). 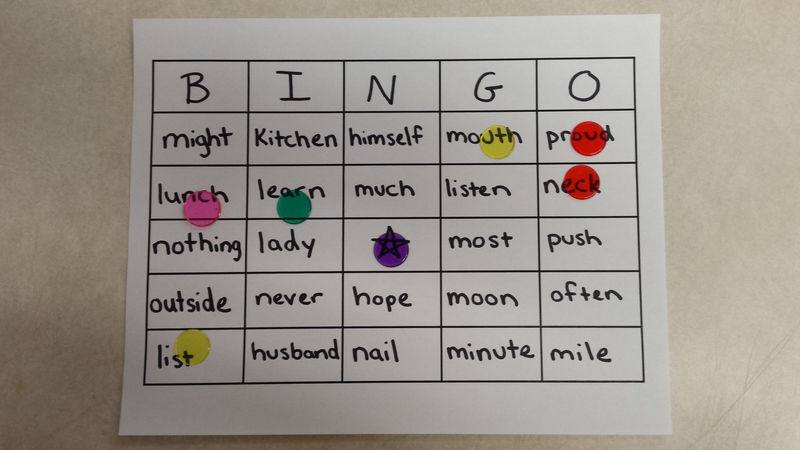 This activity could also be adapted to be a vocabulary lesson. 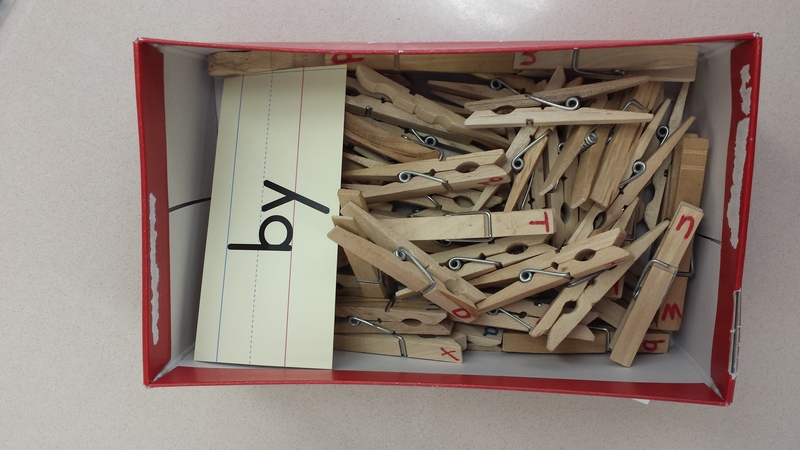 Use index cards with definitions and write the word on the clothespin. Children have to find the correct definition and pin it onto the matching card. The possibilities are endless! I had a million craft sticks that were donated to me by a retiring teacher. I wanted to use them up but wasn’t sure how to get a motor skill out of simple craft sticks. I used the vocabulary list from my teachers to make cards again. Then, I used a box cutter to make little slices in the top of a shoe box. It’s better if the shoe box isn’t too high, so the sticks don’t fall through. BUT! I did have one box that was too big, and the kids learned that they had to modulate the amount of force they used when putting the sight word in the hole so it wouldn’t fall through. This is a great skill for kids who press too hard on their pencil and squeeze too hard on the glue. I also like that the children had to put the stick in the correct slot. 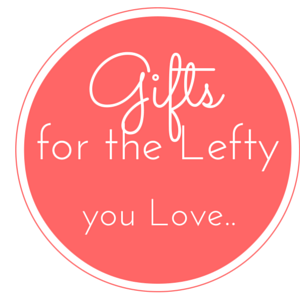 It helped to build their awareness of left to right fluency and also spacing. You can’t just put any letter anywhere or the word won’t be correct. This activity was designed for some of my preschool students who are having difficulty sorting by color. The children actually had good fine motor skills for their age, so I used these tiny “Perler” beads to keep the “just right challenge”. 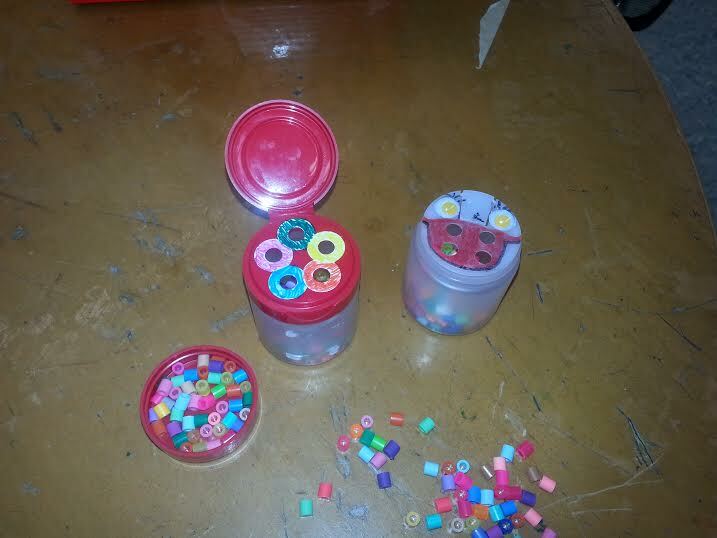 They had to discriminate through the beads to find the proper colors in order to put them in the right hole. I used loose-leaf reinforcers and magic markers to mark the colors with an empty spice container. Sorting and categorizing is a math skill, but they are also language based skills that a child needs in order to develop good literacy. 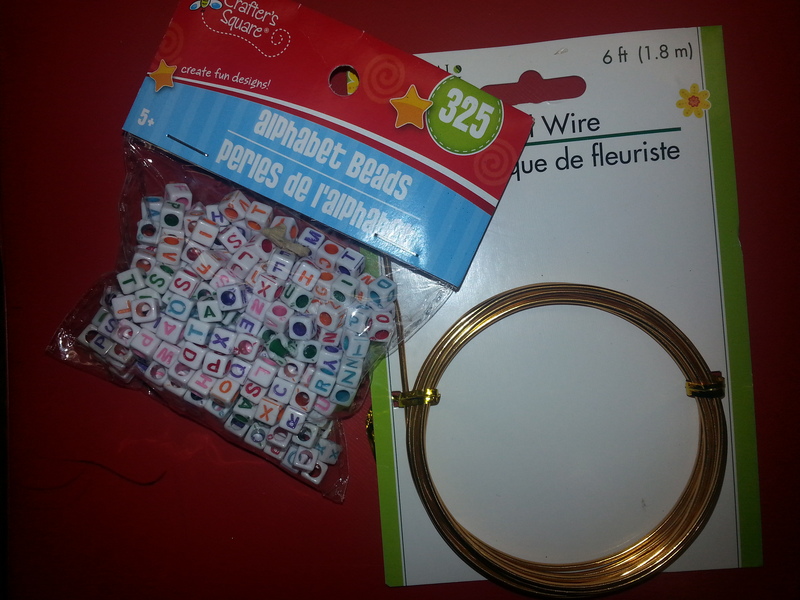 I bought these “ABC” beads and this floral wire at you guessed it, the Dollar store! I cut the wire into different lengths so I could use them for different boxes. One of the teachers had sent me her “words to know” from the Journey’s program (aka sight words) via email in a label template. So I printed them out, stuck them on index cards and done! I should mention that I always print out the directions and paste them inside the box. This way I can make sure the teacher or teachers aide knows exactly what I want the kids to do. I also go through each box with the kids when I present them, to explain what they need to do. The tricky thing with this center was that the kids would pick a card and then find the right beads. But they had to WAIT to put them on the wire until they found all the letters. Otherwise their word would end up backwards. In my directions I explained to the kids that they had to find the beads, put them in order, then string them (last letter first). They had to put a plain colored bead in between the words to represent a space. Then, they had to write the 5 words on loose leaf. This center reinforced left to right directionality, spelling, writing, and recognizing sight words. It also worked on using a pincer grasp to pick up the small bead, using bilateral skills to hold the wire and get the bead on, and left to right tracking to line the beads up properly. Don’t forget Visual Perceptual skills to find the bead they needed and to recognize the letter whether it was upside down or turned sideways. I had some Linking cubes that I hardly ever used. You could also use Legos or Mega Block if you have them. 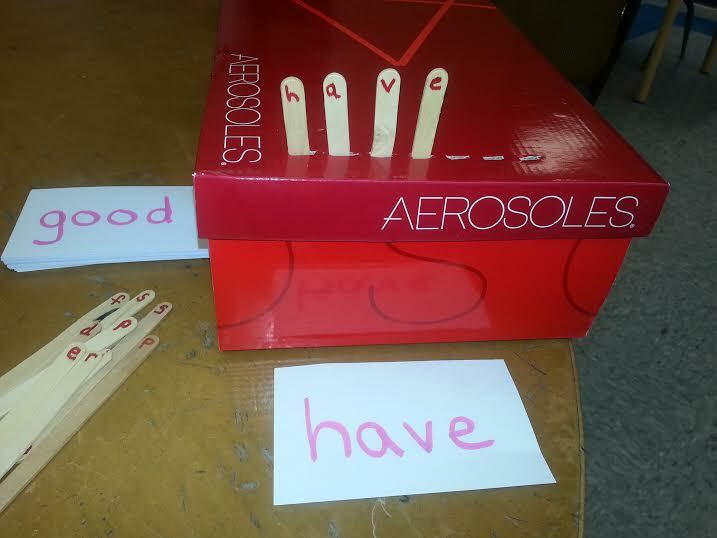 I used the same pack of Dollar Store sight words and I used a Sharpie to write the letters on the blocks. I suggest putting all your cubes together before you write the letter so they are all facing the right way. I made a few long towers and then wrote all the letters, extra vowels, and popular letters. Then I flipped the cubes over, and wrote more letters on the back. This way the kids had double the letters with half the blocks. I also included some fun pencils in the box so the kids could practice writing the words. Kids love anything novel. The kind of pencils where you can pull the top off and stick them in the back are always a hit! Plus they work on bilateral skills and pincer strength! I love to use dice with children in any way I can. 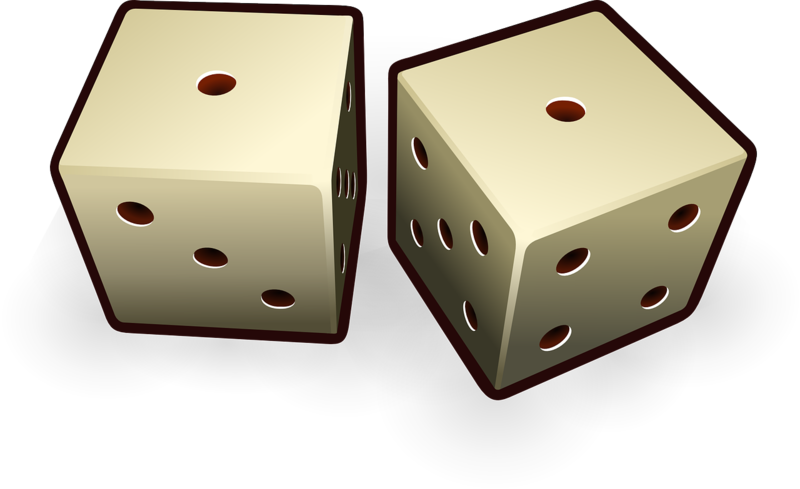 The first thing that most teachers don’t realize is that children don’t actually “roll” the dice. That is because they really haven’t developed the arches in their hands yet. You need arches in your hand in order to make a “cup” so the dice don’t fall out. There was a cute pin on Pinterest of dice in a clear Tupperware. It’s kind of like the “popper” from the game Trouble. I think it’s a great idea because children can shake the Tupperware and the dice don’t go flying…. BUT, I would rather deal with the flying dice so that children can learn to use the arches in their hands to hold things (including dice) without them falling out of their hands. I feel the same way about glue sticks – Ok, so there is no mess, but there is also hardly any work involved. Kids need to squeeze, turn the cap, and learn when to Stop squeezing. They benefit way more from real glue. But I digress! It is easy to think of ways to use dice for math, but for literacy? There are still a lot of ways to use dice. I have seen “Roll A Sight Word” sheets in many classrooms. You can use my free BINGO template for this purpose, too. You can use the concept with any subject. It’s simple to assign each number a word or even a definition for older kids. An example: a Kindergarten student is practicing simple sight words. The teacher has a simple work sheet with a “key”. The child rolls the die and then colors in a box with the word in it or writes the word in the box. The child is using future math skills (probability, graphing) with current math skills (counting, number recognition) as well as literacy skills, recognizing the number, matching it to the word, remembering that the number two is code for “she”. They are also using motor skills to build the arches in their hands to hold the die and “roll” it, rather than drop it or throw it. (They often need to be shown this). Then, they are working on pencil or crayon grip and fine motor skills to write or color. That’s a lot of things accomplished with a die activity. The activity can be adapted to fit any teacher’s needs. Let’s think about the same activity for a fourth grade teacher. She can use it to work on social studies definitions and vocabulary. Fourth graders often study in class by copying definitions from the textbook or from the board, doing fill in the blank sheets, or multiple choice questions. Here is way to make it a bit more fun AND work on those hand muscles. When the child rolls the die and reads the definition, they have to find the corresponding word on a sheet and color it in. Now the child is working on vocabulary and motor skills at once. If you wanted to add another component, you could add an extra die, make more definitions, or have the kids write the word instead of color. You could even have the kids write it in script. The possibilities are really endless. You just need to think about your typical classroom and homework routine in a different way (aka involving motor skills). There is an easy way to incorporate scissors skill practice into literacy. Cut till you get to the words you need! Again, you can modify this concept any way you want. 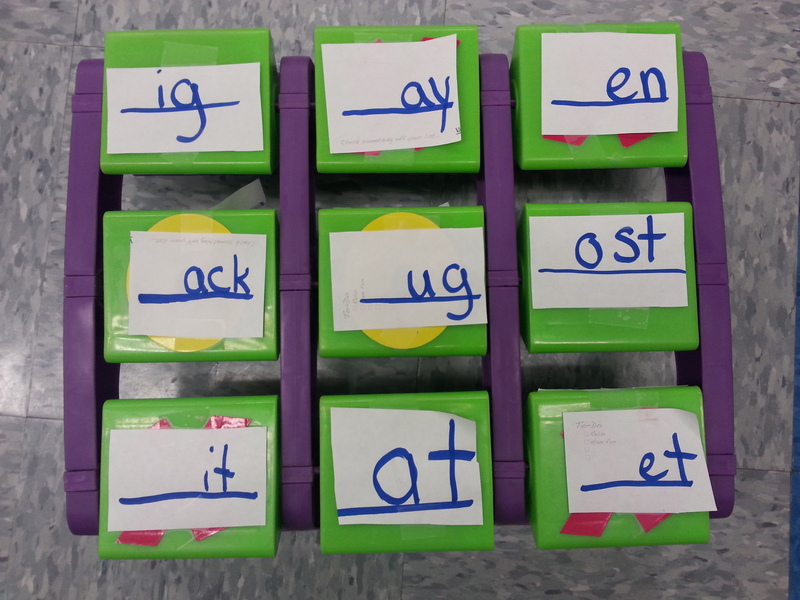 Use it for letter or sight word recognition or to learn vocabulary. Once you start thinking differently, you can adapt anything. I’ve also made motor boxes to help kids learn their word families. I’ve used plastic eggs and also other novelty items (like these eyeballs ) to make it fun. You can write on anything with a Sharpie. Twisting eggs takes fine motor and bilateral coordination as well as forearm rotation, which kids need in order to cut with scissors. Scooping with these great measuring spoons (Dollar Tree!) also works on forearm rotation and eye-hand coordination. These eggs end up sticking around all year long! I made different eggs for each word family, with magnetic pieces to make up some of the words in that family. 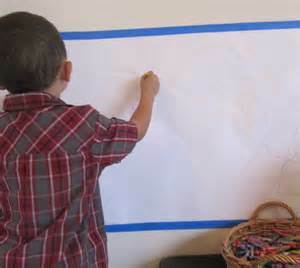 Kids can use the whiteboard or an easel to make the different words, and then write them. This simple boxed worksheet is the one resource that I use all the time (and hopefully you will too!) Shown here is a simple spelling review activity for a second grade class. Children were given a handful of Bingo chips and told that they need to hold at least three in their hand. When they hear the spelling word called, they have to use their fingers to manipulate the bingo chip to their thumb and pincer and then place it on the correct box (word). Children try to compensate for decreased in-hand manipulation skills “dropping” the chip onto the board, or using their other hand to simply pick it up and place it in the right spot. The purpose of this activity is to work on a skill called “translation”. Translation is the ability to move an object from your palm to your fingertips. Picture having your hands full and manipulating your ring of keys to get the right one into the door knob. Or trying to get the quarter (when you have a handful of coins) into the slot of the vending machine. This activity can even be used for high school students. Teachers can put definitions, vocabulary words, you name it in the boxes. I’v also used it to work on letter recognition in script and print. And what child doesn’t like to win BINGO? If you don’t have Bingo chips, change it up. Use coins, stamps, or even stickers. Anything that the kids need to manipulate within their hand is good! Click the link below for your FREE printable template that can be used and customized in a million ways. 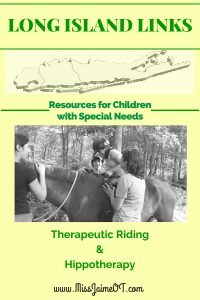 Everything can be adapted to be appropriate for children who are significantly delayed. Make the pieces bigger, make the directions more simple, etc. I know that I am simplifying what can sometimes be a very difficult task. Modifying curriculum so it is still appropriate but still achievable can be a challenging task for any therapist/educator. 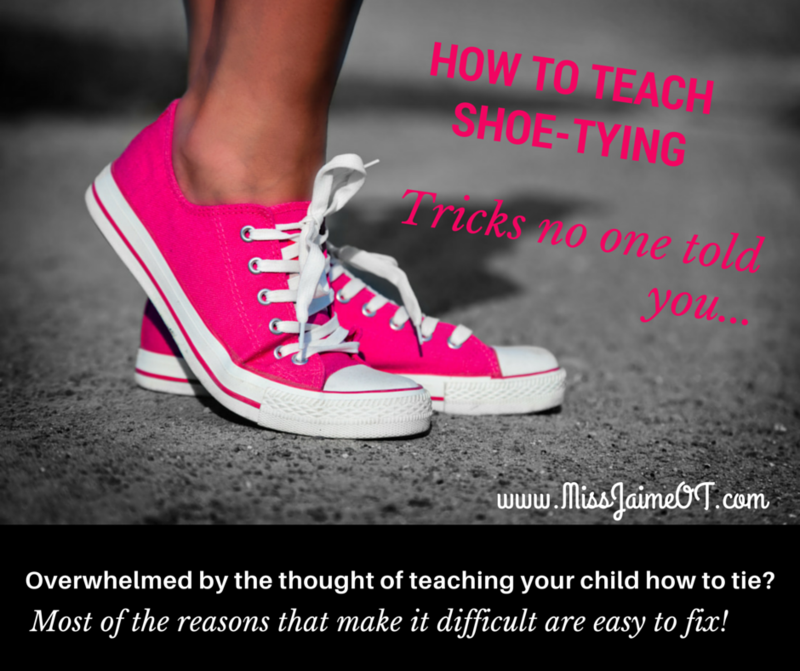 Simple adaptations such as using bigger pieces or using simpler directions can really help. Here was one way that I adapted the “bingo” idea. I used checkers from a “Connect Four” game that had broken. I put stickers on the face of the checkers and then used a sharpie to write letters and simple sight words. I had the children pick up one checker at a time and place them on a simple sheet. Some of the children were non-verbal, but they knew the letters. Using the larger coins allowed them to work on their sight word or letter recognition, grasp and release, fine motor, and dexterity skills just like their peers. 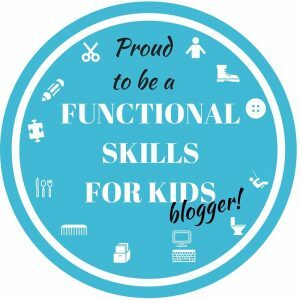 What about Gross Motor Skills? Here’s two ideas to incorporate gross motor skills into a small group lesson. Playing with balloons is always fun. A bag of balloons can cost $1 dollar for 12 balloons, so that’s a great bargain. Balloon play helps a child with visual tracking, eye-and coordination, and crossing the midline. It also addresses some sensory issues for children who don’t like smells like latex or loud noises like popping. You can use your imagination to come up with an activity that suits the needs of your class, but here is one that I like to do with small groups. Give each kid a balloon and a Sharpie. You can incorporate music if you want to. Play keep it up, where the kids have to keep their own balloon in the air until the music stops or the teacher says “freeze”. The teacher then says a sight word, a definition, or a category. 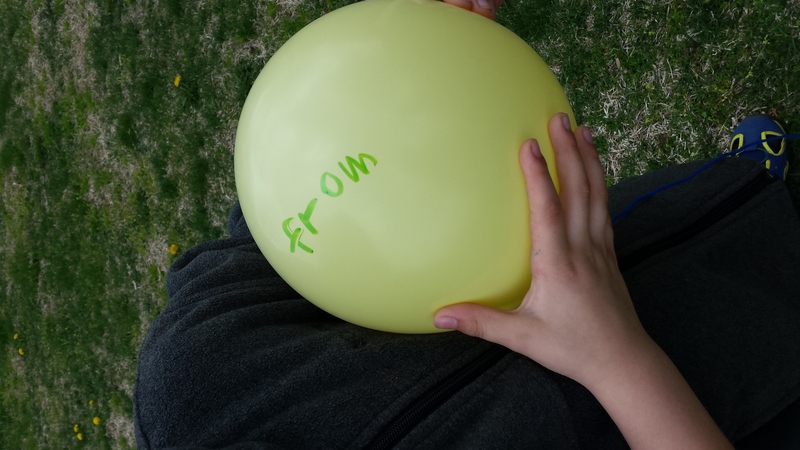 The children use their Sharpie to write the answer or the word on the balloon. The teacher is incorporating the lesson and literacy activity at hand with the motor skills involved in balloon play. This allows the children to showcase and build their knowledge while still getting some active juices flowing. I’ve played this with my students outside and inside. I found that playing inside made the kids negotiate the obstacles (desks, cubbies, etc) in the classroom. Playing outside let them breathe fresh air, play in natural light and run. Sometimes the balloons pop if they hit the grass, though. 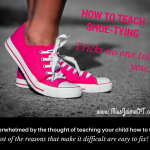 You can prevent that by tying a string around the balloon and the child’s wrist. Now its more like a paddle balloon. Whatever! It still works on all the skills I’ve mentioned…. In my OT/PT room at school, I had a tic tac toe board that I barely ever used. I decided to use it a different way by having my students work on their word families. I set up the tic tac toe board right by the Smartboard. The kids lined up excitedly to throw a bean bag at whatever square they could. When they hit a word ending, they had to tell me a word from that word family and then write the word on the board. I pulled up lined paper on the board so the kids could also practice writing their letters on the lines with proper spacing. The kids thought they were “having a break”, but we were also able to target a literacy skill that they needed help with. Teachers can incorporate these motor skills into their classroom lessons or reading groups at any Tier in the RTI process. Tier One is a general intervention to be used with all students. Teachers can and should incorporate motor activities into their lessons as a general practice. Tier Two instruction targets 5 to 10% of the students who are not making adequate progress in the core curriculum. Targeted instruction is provided based on the students needs and rates of progress. Motor activities can easily be incorporated into small group instruction. Teachers can find simple ways to include movement and motor skill activities with the reading and literacy activities they are focusing on for Tier Two interventions. Tier Three provides Intensive Instruction on top of regular core instruction to 1 to 5% of children who aren’t responding to interventions. As the teachers monitor the progress of the children and determine what interventions to put in place, motor skills are being addressed and monitored as well. Literacy is of utmost importance. Teachers are being evaluated based on their student’s reading scores and levels of success. Common Core has increased the demands of the curriculum so that Kindergartners are doing what used to be done in the First grade. 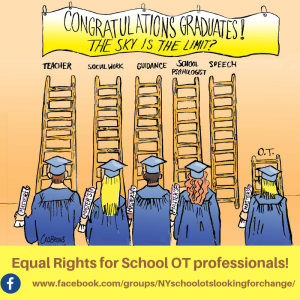 As an OT, I am amazed and impressed with what our children are able to absorb and learn. But it is still so important that they have a chance to develop their motor skills. Any movement activity that can be incorporated into a literacy or reading lesson should be. We as educators and parents need to remember to look at the whole child. 1) Reading is really important, but there are many other skills that help a child to read well. 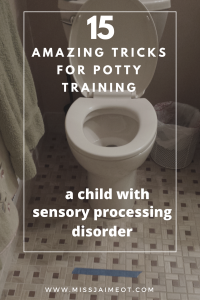 Visual tracking, language, letter recognition, and postural control are just a few. 2) Kids need to move! 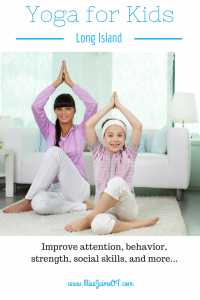 Movement helps them to maintain an engaged state of mind so they can focus. It lets them get their wiggles out. They are still kids! Research shows that when kids move as part of learning they process information better and the learning stays with them for longer periods of time (Jensen, 2001). 3) What about writing? Yes, we know that technology is taking over the world and even little kids can text. That doesn’t take away the fact that they still need to learn how to write properly. Using a pencil to write helps them to use all of those little muscles in their hands that they need in order to live life. To open a bottle of water, to zip their own coat, to sharpen a pencil, to use a fork and knife….the list goes on. Writing in itself is a fine motor skill, and so is coloring! It drives me nuts when teachers tell me they aren’t supposed to color anymore. What?! 4) Coloring IS meaningful and purposeful for children of all ages. It is exercise. 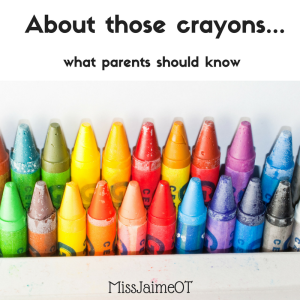 Teachers who incorporate coloring and drawing into their lessons are building fine motor strength as well as helping children to create memories associated with pictures or words. The association of pictures with words or vocabulary can help solidify a child’s learning. 5) Don’t forget your BINGO FREEBIE! I hope you come up with a million ways to use this simple sheet. Jensen, E. (2001). Arts with the brain in mind. Alexandria, VA: ASCD. I really hope that my “Motor boxes” have inspired you to to start creating! What motor centers did you create for your students? As always please feel free to comment! I love to hear from readers! Check out the rest of the posts on the blog hop! 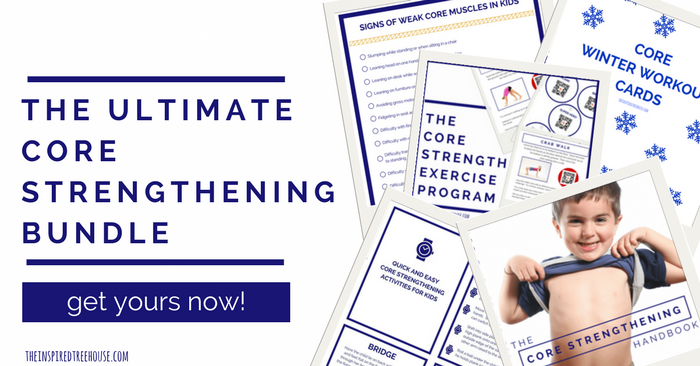 There are tons of free resources available. 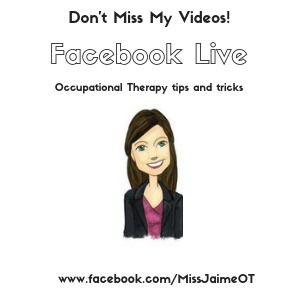 Have a Question for an OT? Contact me! 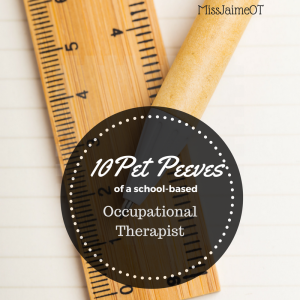 I love to answer a parent’s questions from an OT’s perspective! Hi Dena! Thanks for the compliment! You don’t need to go to a teacher store; you can buy anything online! Children who are four are often still developing a comfortable pencil grip. It can be hard for children to develop separation of the two sides of the hand, but a pencil grip can help. I usually try not to use a grip until I’m sure that the child is physically having difficulty. That means that I have taught them many times where their fingers should go and where the pencil should sit in their hands. When I ask them to hold the pencil correctly, they try to and they know what I mean. The problem is that due to weak strength and endurance, they can’t maintain a proper grasp. So then, I use a pencil grip. My favorite “go-to” grip for preschoolers is called “the pencil grip”. I like it because it’s “fatter” towards the back which helps kids to open up their web space. This is the area between the thumb and the index finger. There are specific spots for each finger, but even if they hold it wrong, it’s still ok. Here is what it looks like. Another good one that I like for kids Emilia’s age is the “writing claw”. This one can be a little tricky to learn how to use, but once a child gets the hang of it, it’s great. There are spots for the thumb, index and middle fingers. Pencil grips can be uncomfortable for children at first. That’s ok, it’s uncomfortable because the child is now using the correct muscles, and they aren’t used to doing this work. Keep encouraging them and use it consistently. It will pay off! Also, you can help your child to “tuck in” the ring and pinky finger by having them hold a pom pom or a cotton ball in those fingers. It helps to keep the pinky side of the hand separate from the thumb part. Another way to make it easier for your child is to play games and work with toys that require separation of the two sides of their hands. Classic games like Bed Bugs, Lite Brite, Operation, etc. are examples of toys that encourage this. Good Luck, Dena! Keep us posted! So many parents lose hope for improving their child’s handwriting after elementary school. It definitely can seem hopeless at times. How do you change a habit that has been developed over so many years? There’s always the old “kids don’t need to write anymore, they can just type”. But seriously, that’s not realistic. Everyone needs to be able to write legibly. 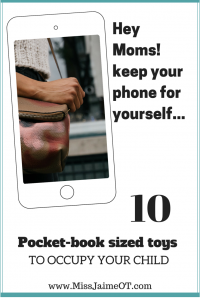 Even if it’s a quick note, a shopping list, an address. How many times do you just need to jot something down? 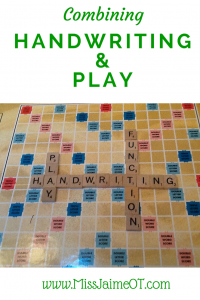 Please believe me – there IS hope for improving legibility after elementary school. I swear. Pencil Grip – Forget about it? It is very, very hard to change a poor pencil grip after the first grade. On top of that, it gets harder each year after first grade. By middle school, it is practically impossible. The only way to change a child’s grip after the first/second grade is if the child is willing and motivated. If not, you really have to consider if it’s worth the fight. I am a huge advocate for correcting grip and pencil habits in little ones because I have seen the repercussions of neglect. Children who don’t hold their pencil correctly are sometimes using the wrong muscles to write. When you are writing, the thumb should be doing most of the work. If you notice that the thumb isn’t even moving or bending at all, it isn’t doing any of the work. Some kids are able to compensate by having the other fingers move the pencil. Others (worst case scenario) are still relying on their wrist and shoulder because they haven’t developed shoulder stability. This habit should be gone by the end of kindergarten. So…..back to middle school and handwriting. The problem with a middle schooler who is using larger muscles (whole arm and wrist) to write is that it is extremely tiring. Think about how hard it is to hold your arms up in the air (in a T) for a whole minute. This is how your middle schooler feels. Now add common core and all the writing. Yikes. The result? One word answers, the shortest sentences possible, and no data in your Document Based Questions (DBQ’S). Middle schoolers are expected to back up their answers with “text based evidence”. This means detail, information, and in other words – effort. Can you put forth effort and motivation when you are exhausted? As I said before, if your child isn’t motivated or willing (or bribable) to change their grip, it probably won’t happen. They will find ways to compensate down the road, which is good news. As an Assistive Technology professional – I think it’s great that children have access to computers, Ipads, smartphones, etc. As a Handwriting Specialist, it makes me worried. In life, you need to be able to jot a note, make a list, etc. But…technology is the wave of the future, and you better get on board or be left in the dust. (That is my two sides fighting with each other). So if they aren’t motivated, and they aren’t giving their best work because that involves too much writing, find another way. Let them type their essays – notice I said, “let THEM type”. I know that parents are only trying to help, but kids need to do as much for themselves as possible. First, even if they are only using one hand or one finger – they are gaining keyboard awareness. Trust me, in a few years, they will be moving much faster. Second, typing is awesome fine motor work. If they are using more than one hand or one finger, they are developing the ability to move one finger at a time! This would have been developed in Kindergarten if they had been holding their pencil properly. Oh well. If your child truly isn’t capable of typing all their work, make a deal. Set the timer for ten minutes and have them type. (It doesn’t matter if they type one sentence). Then you can help and type the rest. Next week – eleven minutes. You get the picture. If they are motivated and willing, have them use a slantboard to write on. 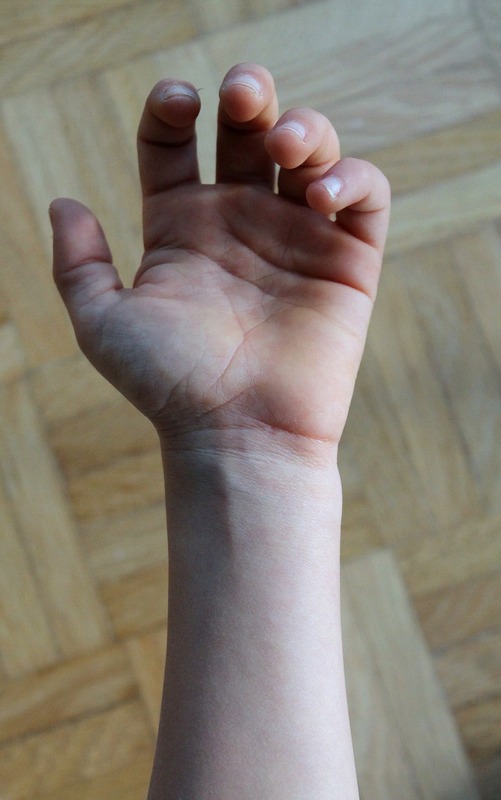 This will put their wrist in extension (bent upward), which promotes finger movement. You can give them a pencil grip if they are willing to use it. Sometimes kids will use it because it is novel and anything new is cool. Awesome. If that is the case with your kid, change the color of the grip every week to keep them motivated. It will take a few months before they can begin to break their pencil grasp habit. Many children get frustrated because using a slantboard and/or a grip takes longer. This is because they are using smaller muscles, making more precise movements. Sometimes this makes messier handwriting at first because these tiny hand muscles aren’t used to writing. However, sometimes it leads to neater handwriting because your Speedy Gonzalez who hates writing and just wants to be done needs to slow down in order to get anything on the paper. You know your child. You need to pick your battles and focus on what is really important. But my advice is to really try. With a motivated kid, amazing things can happen. If they are really trying and get tired, give them a break and go back to it. That’s ok. They are training for a marathon. It takes time to gain endurance. Letter formation – is there hope in Middle School? Not really. This is another reason why I am such an advocate for proper handwriting instruction for preschool and kindergarten. I once had a kindergarten teacher say to me “but it’s kindergarten”. This was because I was letting a child’s mom know that the child was making the lowercase letter “a” incorrectly and to please remind her at home. ( This sounds so type A of me. However, it is part of my job to try to get parents to follow through with what the teachers are teaching all day long. Many parents have absolutely no idea if their child is forming letters correctly. That’s Ok – they have an OT in the building who will gladly keep them posted. ) In my defense, the child had two lowercase a‘s (Anabella) in her name. She had already been doing the letter in class and in her workbook with her classmates. If I can read it when she is in the sixth grade, I don’t care. But, if that child is now so comfortable that she is writing quickly and her letter “a” looks like an “o l”, then I care! This will impact her on a spelling test, job interview forms, writing an address on an envelope, etc. So, I will make the effort to let a parent know if their 5-year-old child needs a little practice with something. Some habits are really tough to break. Of course, Kindergarten used to be all about “reading, writing, and arithmetic.” That was before Common Core. The “writing” part has definitely slipped in the ranks! So how do you make it easier to read? So here is the good news. There is still hope. I worked with Middle School Special Ed Children for about five years. Most of them had classifications of Learning Disabled, Speech and Language Impairments, and Other Health Impaired. Many of them had very poor handwriting. Most of them did want neater writing, but really disliked writing (because it was hard). 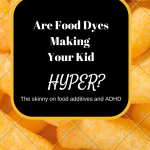 So, rather than focus on letter formation, directionality, and other habits that are very hard to break, I focused on the things that I could change. YES. Less room means less mess. Smaller lines can mean smaller letters. 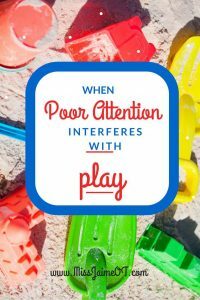 This is especially true for children who have visual-motor issues. Many of them automatically adapt their letter sizing to fit in between the smaller lines. This also limits those “extra” lines and “tails” on some of the letters. When you give them the paper, teach them to skip lines. Although this may seem “immature” to skip lines when writing, it really improves legibility. If you need to, you can highlight every other line for a while, or put an “x” or a dot to help your children see which line to go to next. Trust me, it really does make it easier to read. My favorite “narrow-lined” paper is Handwriting Without Tears Double Line Narrow Paper. It already has big spaces in between the lines. Then try to help them space. Even if the letters in a word are messy, if one word is separate from another, it is automatically easier to read. So, once your student has learned to decrease the size of their writing, you can work on spacing. 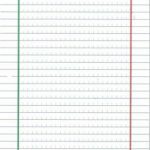 You can try using graph paper (one letter per box, two spaces per space, etc.) There is also specific “spacing paper” that looks like looseleaf with tiny lines to help you space each letter. You can buy it at staples or office max. It’s called RediSpace Transitional Paper by Mead. There is actually a green margin on the left and a red “stop” sign at the right. Some children who have difficulty adhering to the margin may benefit from the color. Middle school children may feel “too old” to finger space, but you can give them a popsicle stick or even have them use a pencil to space in between their words. 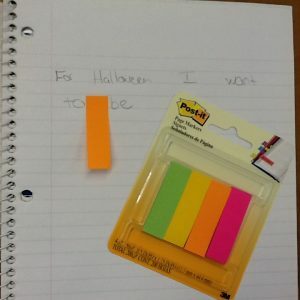 Another great trick is to use the Post-it® Page Markers as a spacer. It is sticky so the kids can move it just like they would with a popsicle stick or their finger. However, it is more “mature” looking for your very “cool” teens who could never be seen using their finger. I have found that once they start writing smaller, they seem to space better. Like I said, most children “want” neat handwriting. So when they see that something helps, they become motivated. I think that is why the “College lined” paper helps with spacing. Colored margins are great for kids who need visual cues for spacing. This is what Meade Redispace paper looks like. Sometimes it works wonders. I have to admit that I have spoken to my more mature and “wordly” middle school children about how this paper is what “college kids” use and how they will be in college someday. I have shown different writing samples to kids and asked them what grade they thought the student was in. I had one girl that was such a “teenager” – very cool. But her handwriting was so large and bubbly that it looked like an elementary school student. I showed her two samples – a typical eighth grader with small, neat handwriting, and a handwriting very similar to hers – large, no spaces, & bubbly. I asked her what grade she thought the kids were in. She realized that the smaller, neater handwriting was an older child. As a very “cool” girl, she wanted to have more “mature” handwriting too. Voila – it was the actual “awareness” and motivation that changed her handwriting. Not her physical ability. 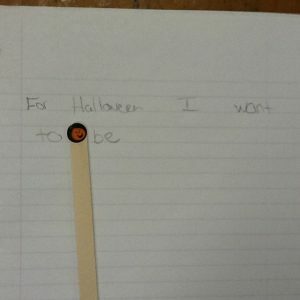 Middle School and Handwriting…Is there hope? YES! 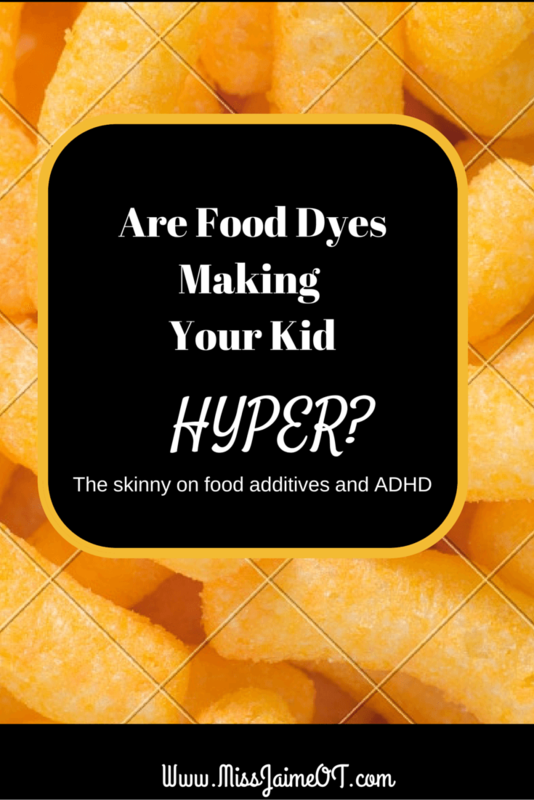 Did you love these tips and tricks? Be sure to check out “The Handwriting Book”, written by a team of nine other pediatric OT’s and PT’s (including me!). 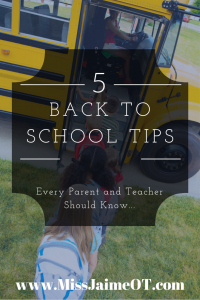 It is full of wonderful strategies to use at home or in the classroom! Shoulder stability: a necessity for good fine motor skills! Shoulder stability provides an important foundation for fine motor skills! 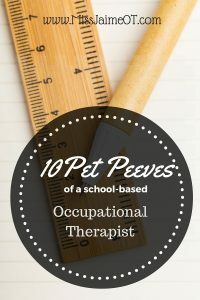 It’s really the first thing I look at as an OT when a teacher asks me to “screen” a child for OT difficulties. Shoulder stability should be established by the time a child starts kindergarten. When it isn’t, it can lead to difficulties in the classroom, especially for writing and drawing. This toddler has her arm up off the table – that demonstrates lack of shoulder stability. Do you remember when you first started coloring? Toddlers use their whole arm to scribble. Then, as the child progresses developmentally, they begin to rest their forearm on the table. 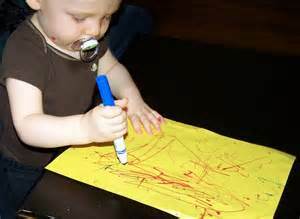 This helps them to start using their hand and fingers (instead of their shoulder and arm) to control the crayon. They develop the ability to keep their shoulder stable during fine motor activities, which helps them to use the small muscles of their hand. This is called shoulder stability. Shoulder stability is an important developmental milestone for children who are learning to color and write. A child should be able to rest their arm on the table and use only their fingers to move the pencil by the time they enter kindergarten. 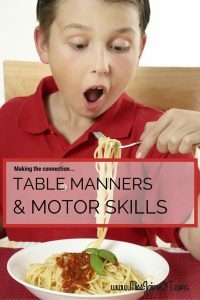 Check out your child – is their elbow off the table? Are they moving their pencil with their fingers or their whole arm? 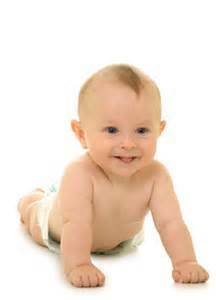 Babies who don’t crawl for very long or can’t tolerate “tummy time” are often delayed in developing shoulder stability. This makes it harder for them to learn how to write. As they reach first or second grade, they often complain that they are too tired or that their arm hurts during writing assignments. That’s because they are using their entire arm to try to make a tiny letter, which is very hard work! Tummy time is really important as a baby. 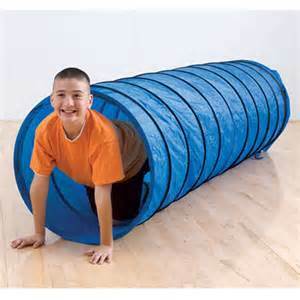 It helps children to develop shoulder stability and good fine motor skills down the road. 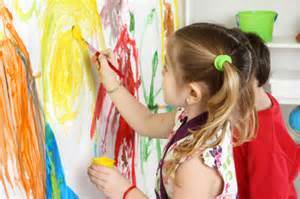 Encourage your child or your student to write on a vertical surface, such as a chalkboard or a dry erase board. Tape a worksheet to the board or a wall and let them write standing up. Did you know that they make the chalkboard and dry erase contact paper? This is a great way to encourage shoulder stability. The child will lean on the wall which forces them to use their fingers! Give your student a slant board or a six-inch binder that slants downward to the child. This forces the wrist to extend upward, forcing the fingers to do the work. For younger children, encourage laying on the tummy to read, play games, do puzzles. 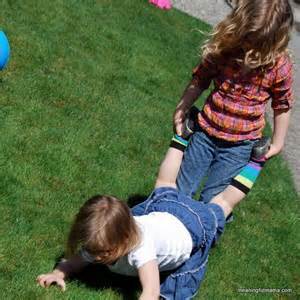 Encourage crawling, wheelbarrow walking and using their arms to hold their body up. Writing on the Wall is a Big Help! Tummy Time Works! Here is my one of my success stories. Look at that perfect Shoulder Stability! I hope you try some of these techniques – remember developmental progress takes time and patience, but it happens!